Ard Ri is played on a board that is 7x7 squares. 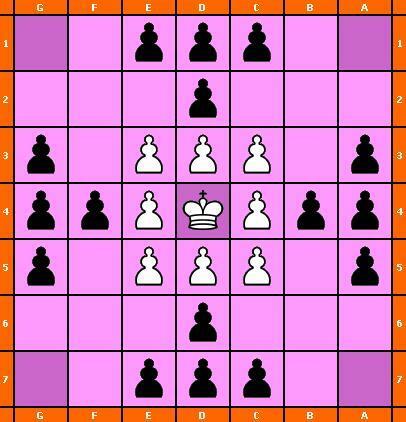 The white player directs the king and his eight defenders, and the black player directs an army of sixteen attackers. At the beginning of play, the king is placed on the center square of the board (the throne) and his defenders are located at the four sides around the king. The opposing attackers reside around the perimeter squares in four phalanx formations. The object of the white player is to get the king to occupy any square on the edge of the board. The black player tries to capture the white king. Only one piece can stand on each square. After the king leaves the throne, no piece can move to the throne. However, the king may return to the throne if desired. 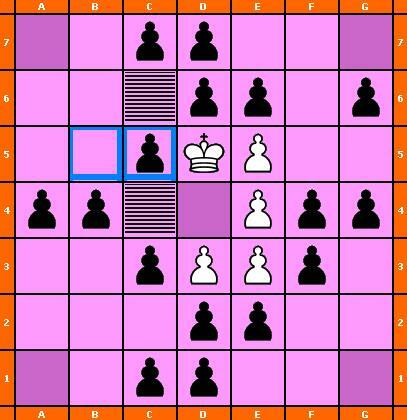 Each player can capture the opponent’s pieces by “sandwiching” or “flanking” an opposing piece either vertically or horizontally between two of the capturing pieces. If a player moves a piece between two opponent's pieces, the piece is not captured. The king CAN take part in capturing his adversaries (whether he is the moving piece OR not), this attribute is only for defenders and attackers. Captured pieces are removed from the board. The king reaches any square on the edge of the board. The white player wins. Attackers surround the king from all four sides (the four cardinal points) and capture him. The king may not be captured against the throne (since he can move onto it). The black player wins the game. A player cannot make a legal move. This player loses the game.